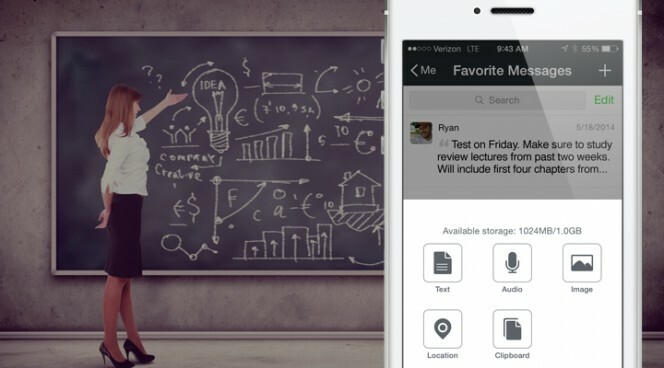 Use your phone to take notes, snap a shot of the whiteboard, or record what you’re learning in class. Just tap “Me” > “Favorite Messages” > “+” > Choose Text, Audio or Image. When you’re finished, add a tag such as “History Notes” or “Club Meeting Minutes” to easily find later in your Favorites folder. 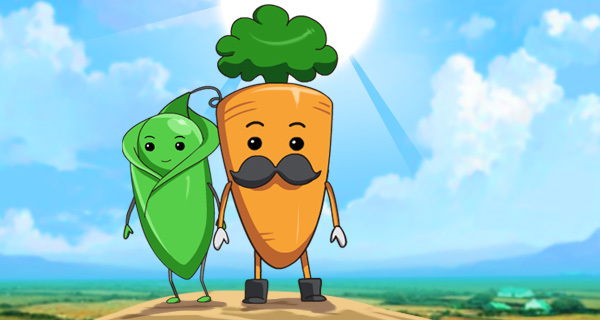 Sticker Story – Meet the Dynamic Veggie Duo: Pete and Charlie! Our WeChat Sticker Gallery is constantly growing with new characters to love and share. To give you a glimpse into the lives of some of our newest fun and quirky stickers, we give you Sticker Stories, exclusively for Chatterbox! Get to know the wide range of characters that make you smile, laugh and help you express your emotions. In life, there are all kinds of amazing pairings – peanut butter and jelly, salt and pepper, etc. Then, there’s Pete and Charlie, the two closest friends you’ll ever meet. Ever since they sprouted from the garden, this pair has done everything together! During the day, you can find this duo pumping iron at the gym. For Pete and Charlie, it’s all about staying healthy! Created by popular t-shirt designer, Chow Hon Lam, Sushi Sushi is now one of WeChat’s hottest new sticker packs. 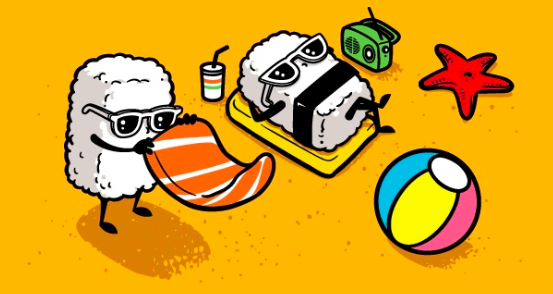 From his love of sushi, Lam originally designed the Sushi Sushi characters for his company, Flying Mouse 365. The dynamic duo became so popular that Lam decided to continue the sushi story in a new playground – WeChat’s Sticker Gallery. Here are the top five things you need to know about Sushi Sushi from the designer himself. There are only six degrees of separation standing between you and your favourite singer, sports idol or actress. The hottest stars, Matthew McConaughey, Eva Longoria, Lionel Messi and many more are using WeChat to connect directly with their fans through the use of official accounts. By following them on WeChat, you can chat with them and get an inside look into their lives. For the adoring fans of Italy’s hottest pop star, Alessandra Amoroso, this one degree of separation became a reality during her dell’Amore Puro Tour where the singer collaborated with WeChat to offer once-in-a-lifetime opportunities to step into her world. We are thrilled to release “WeChow” today, the first of two “WeChat in Your Life” videos that highlight how WeChatters around the world can use the app to enhance their everyday lives. Whether it be to communicate their next foodie adventure or to overcome stage fright, these videos tell a few of the great stories behind why we create the features we do. “WeChow” specifically showcases WeChat’s Moments feature, which empowers users to start conversations around images and share them with their close network of friends. The video centers around one man’s quest for the best bowl of ramen by following a noodle-obsessed guy who spends several days sampling bowl after bowl. He uses WeChat to bring his friends along for the journey, taking selfies and writing his reviews. In the end, he finds more than just the perfect bowl of ramen…but also THE ONE girl to start his next adventure. Imagine a world without color or light, just darkness. In China, this is what the universe looks like for 12.6 million people who are blind. More than 700 new books are released every day, but according to the China Disabled Persons’ Federation, these 12.6 million people do not have access to them. That’s why our WeChat China team has created The Voice Donor project. We place special WeChat books in the “new books” section of bookstores. When shoppers pick up the books to read, the pages are blank – with the exception of a simple QR code, inviting them to follow the WeChat Voice Donor account and donate their voice. For awareness, QR codes are also located in select parlors under massage tables. So WeChatters can even scan the codes while getting a massage! After scanning the QR code and picking a book category, WeChat sends the reader a snippet of a book to be recorded using the “Hold to Talk” feature. We then compile the recordings to produce audio books also available on WeChat. 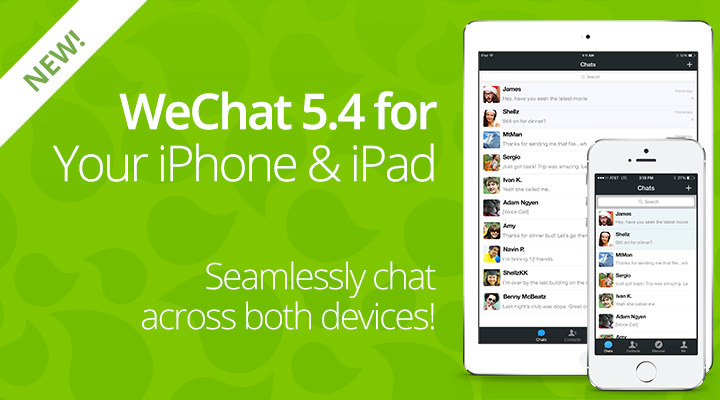 We’re excited to announce our latest update for iOS – WeChat 5.4! We’ve extended the fun to your iPad with a new fully compatible interface and easy one-scan login feature. You can now enjoy WeChat on both your iPhone and iPad at the same time. And with UI improvements and bug fixes, we’re boosting your multi-device experience even further. So what are you waiting for? Take your WeChatting to the next level and upgrade to 5.4 for iOS today. iPad Compatibility: Enjoy WeChat in all its glory now on your iPad and stay logged in on both mobile devices. It’s that simple to take your WeChatting experience to the big screen! When you have installed WeChat 5.4 on your iPad, open WeChat on your iPad and select “Use on Phone and iPad” > then on your phone tap the “Discover” tab > choose “Scan QR Code” > then scan the code on your iPad. Your morning commute just got better! Introducing Thunder Raid, WeChat’s newest action-packed aerial shooter game. Your mission – to shoot down the opposing faction, a fleet of enemy planes each protecting and led by their evil sky boss. Hone your skills by dodging their fires, collecting gold coins and jewels for upgrades and stronger weapon. Do all successfully and you’re sure to beat the bosses. But remember, each level has its own evil sky boss piloting an enormous aircraft with each getting tougher and tougher. The best part is you can customize virtually every aspect of the game – your planes, pilots, attack modes and terrain to fight back. 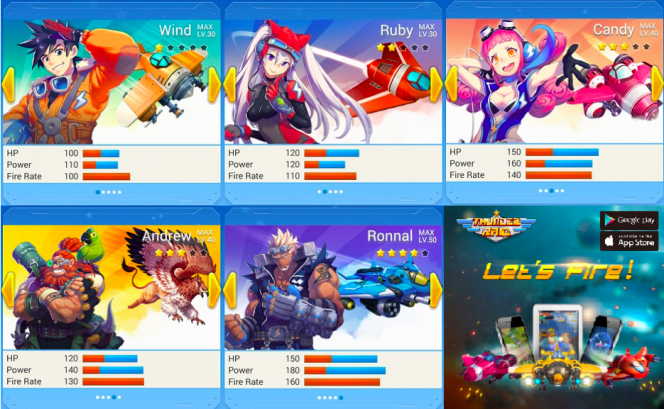 Wind, Ruby, Candy, Andrew and Ronnal, take your pick! Each character has his or her own weaknesses and strengths; it’s up to you to decide which one is best for you! Sticker Story – Meet Man (and Woman’s) Best Friend, Coco Puff! Most dogs can be found chewing and slobbering over your favorite shoe or marking their territory on every bush and fire hydrant they can get their paws on. Not this dog. Born in San Francisco, California, Coco Puff is a sassy and well-kempt pooch who loves people, treats and her pink bow. Mastering her puppy dog face and tricks are all in a day’s work for this Pomeranian! Just give her a ball and she’ll play fetch with you all day long, but throw her a bone and it’s a one-way trip on the #strugglebus. Why have 25 separate chats when you can just form one group chat and communicate with everyone simultaneously? Think about it – one chat to coordinate everything from deciding what flick to see, to sending directions to the theater. You can even avoid those long work email chains! Next time you’re spending hours drafting a long text message, think about sending a WeChat voice message instead. You just press and hold the “Hold to Talk” button to record and release to send. Or you can send an animated sticker that perfectly sums up your emotion with one tap. You know the routine. Go to a meeting, exchange business cards, enter contact information into phone, then email to follow up. With WeChat, you can consolidate this into two easy steps. Each WeChatter has a personalized QR code and scanner. 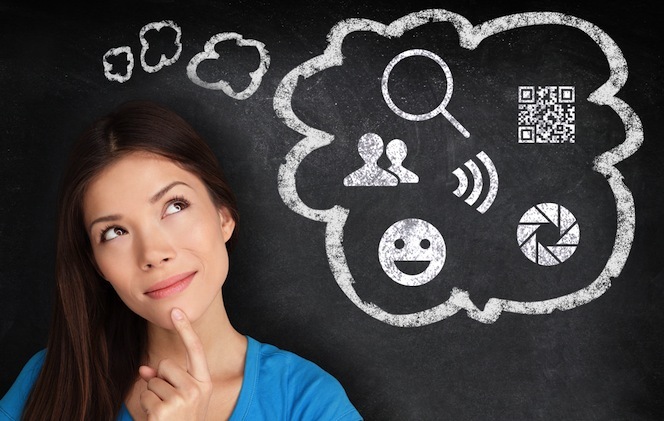 Just scan each other’s QR code after your meeting to add them as a contact then start chatting instantly! Stickers are the new black. They’re a great way to chat with family and friends and express any emotion with just one tap. But at WeChat, we’re not just creating average stickers. We’re taking your emoji fun to a whole new level. How? With animated 3D stickers of course! For the first WeChat animated 3D sticker pack, we teamed up with talented Hong Kong illustrator b.wing to create “Boy A.” Here’s a behind the scenes look at what it took to bring this lovable character to life in 3D. b.wing knew she wanted to create 3D stickers that reflected emotions people experience in everyday life. So every time she felt a certain way in her own life, she would sketch her feelings on post-it notes, her notebook, or any piece of paper she could get her hands on. Each sketch was unique with distinctive facial expressions and characteristics. Once she had all her ideas together, the bunny costume wearing Boy A was born.